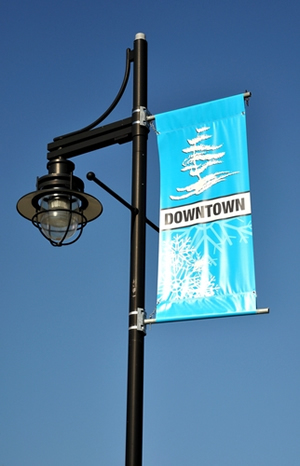 Product Description: Affordable DOUBLE SIDED Pole Banners feature pole pockets at the top and bottom with top and bottom safety grommets to prevent wind pull-off when used with tie-wraps (not included). Full color prints on tear resistant 15 oz. scrim banner material. Normal Production Time: 3-5 business days after art approval. Ask about our heavy duty pole banners when your needs require higher wind strength/tear resistance or longer term/multi-season usage.